With sumptuous production design and breathtakingly imaginative direction, this is a thoroughly engaging, powerfully emotional period drama with a superb script and a terrific central performance from Keira Knightley. 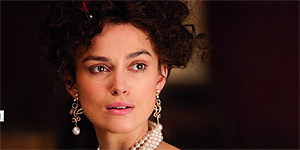 Directed by Joe Wright and adapted by Tom Stoppard, Anna Karenina is based on the novel by Leo Tolstoy and stars Keira Knightley as Anna Karenina, a Russian aristocrat married to stodgy government official Karenin (Jude Law), who begins a passionate affair with the dashing Count Vronsky (Aaron Taylor-Johnson), only to have her social standing come crashing down around her ears. At the same time, Anna's hedonistic brother Oblonsky (Matthew Macfadyen, providing welcome comic relief) encourages his friend Levin (Domhnall Gleeson) to woo the beautiful Princess Kitty (Alicia Vikander), who is also in love with Vronsky. In other hands, Anna Karenina could have been just another handsomely designed costume drama, but Joe Wright's breathtakingly imaginative direction elevates the production into something quite extraordinary. The conceit is that all the action (except, pointedly, for some of Levin's scenes) takes place upon a sort of dreamlike stage (serving as a metaphor for 1870s Russian society), so that the scenery frequently moves around the characters and stagehands are often glimpsed working feverishly on pulleys and so on. The result is refreshing, exciting and unlike anything you've seen before, with key sequences from the novel, such as the racecourse scene, achieving an extra power thanks to their thrilling reinterpretation for the stage. Knightley is superb, delivering a passionate performance that isn't afraid to reveal Anna's unsympathetic side; this is, after all, a portrait of obsessive and ultimately destructive love. Wright also coaxes a trio of unexpectedly terrific performances from Law, Taylor-Johnson and Macfadyen, while Gleeson and Vikander provide the genuinely romantic heart of the story as Levin and Kitty; their delightful letter-block-based proposal scene is the sweetest love scene you'll see all year. Stoppard's engaging script is excellent, encompassing a vast array of supporting characters and giving each of them a moment to shine; notably, it's also the first adaptation to give equal weight to the Levin/Kitty romance and the rewards are keenly felt. On top of that, the mouth-watering production design is impeccable throughout, there's a terrific score by Dario Marianelli and the film is beautifully shot, courtesy of Seamus McGarvey's sumptuous cinematography. Strikingly imaginative and beautifully directed, Anna Karenina is a hugely enjoyable drama with a superb script and a terrific central performance from Keira Knightley. Unmissable.